The Greeks had numerous gods and many stories and myths that surrounded them. Greek mythology consists of all the stories and tales about the Greek gods, goddesses, and heroes. It is also the religion of Ancient Greece as the Greeks built temples and offered sacrifices to their major gods. Below are some of the major Greek gods. Click on the god or goddess to learn more about their individual myths and stories. The Titans were the first or elder gods. There were twelve of them including the parents of Zeus, Cronus and Rhea. They ruled during what was called the golden age. They were overthrown by their children, led by Zeus. Zeus - Leader of the Olympians and god of the sky and lightning. His symbol is the lighting bolt. He is married to Hera, his sister. Hera - Queen of the gods and married to Zeus. She is the goddess of marriage and family. Her symbols are the peacock, pomegranate, lion, and cow. Poseidon - God of the ocean, earthquakes, and horses. His symbol is the trident. He is Zeus' and Hades brother. Dionysus - Lord of wine and celebrations. Patron god of the theatre and art. His main symbol is the grapevine. He is the son of Zeus and the youngest Olympian. Apollo - Greek god of archery, music, light, and prophecy. His symbols include the sun, the bow and arrow, and the lyre. His twin sister is Artemis. Artemis - Goddess of the hunt, archery, and animals. Her symbols include the moon, the bow and arrow, and the deer. Her twin brother is Apollo. Hermes - God of commerce and thieves. Hermes is also the messenger of the gods. His symbols include winged sandals and the caduceus (which is a staff with two snakes wrapped around it). His son Pan is the god of nature. Athena - Greek goddess of wisdom, defense, and war. Her symbols are the owl and the olive branch. 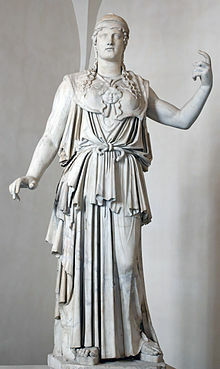 She is the patron god of Athens. Ares - God of war. His symbols are the spear and shield. He is the son of Zeus and Hera. Aphrodite - Goddess of love and beauty. Her symbols include the dove, swan, and rose. She is married to Hephaestus. Hephaestus - God of fire. Blacksmith and craftsman for the gods. His symbols include fire, the hammer, the anvil, and the donkey. He is married to Aphrodite. Demeter - Goddess of agriculture and the seasons. Her symbols include wheat and the pig. Hades - God of the Underworld. He was a god of the Olympians stature, but lived in the Underworld rather than on Mount Olympus. A Greek hero was a brave and strong man that was favored by the gods. He performed brave exploits and adventures. Sometimes the hero, even though mortal, was somehow related to the gods. Hercules - A son of Zeus and the greatest hero in Greek Mythology, Hercules had many labors he had to perform. He was very strong and fought many monsters in his adventures. Achilles - The greatest hero of the Trojan war, Achilles was invulnerable except for his heel. He is the central character in Homer's Iliad. Odysseus - The hero of Homer's epic poem, the Odyssey, Odysseus was brave and strong, but mostly got by on his wits and intelligence.